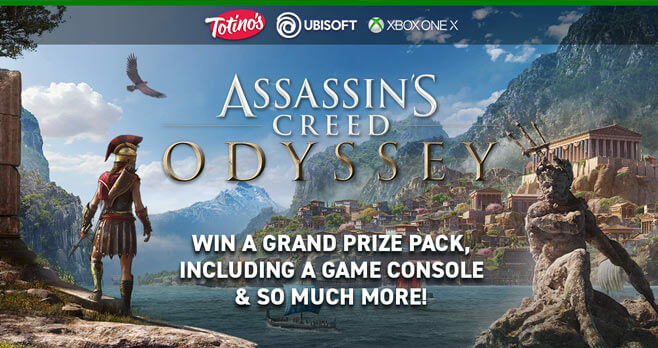 Grab a code on specially-marked packages of Totino’s and enter it at assassinscreed.totinos.com for your chance to win the Totino’s Assassin’s Creed Odyssey Sweepstakes. Up to 20 lucky fans will receive an Xbox One X game console with an Xbox One Gold Edition digital code of Assassin’s Creed Odyssey and more. The Totino’s Assassin’s Creed Odyssey Sweepstakes is open only to legal residents of the 50 United States and the District of Columbia who are at least 18 years old at the time of entry. The Sweepstakes begins on September 1, 2018 at 12:00 a.m. ET and ends on April 30, 2019 at 11:59 p.m. ET. You may enter one time per day during the Promotion Period. The grand prize consists of a Microsoft Xbox One X game console; Xbox One Gold Edition digital code of Assassin’s Creed Odyssey; an Event Exclusive Helmet; a Spartan Shield; Ubiworkshop Hoodie; and Signet Ring & Puzzle Box. Visit assassinscreed.totinos.com to enter and see Official Rules for details.